Today, Montgomery County planners present their recommendations for a countywide Bus Rapid Transit network to the Planning Board. While their vision is smaller than what previous proposals for BRT, they suggest repurposing existing car lanes as dedicated bus lanes in many areas, giving commuters a faster, more convenient ride. In 2008, County Councilmember Marc Elrich first proposed a 16-line, 160-mile system of rapid bus routes. Like Bus Rapid Transit systems being built throughout North America, Montgomery's BRT would have substantial stations with waiting areas and fare machines, stops spaced between a half-mile and a mile apart, and frequent service throughout the day. A subsequent study from planning consultants Parsons Brinckerhoff found that it could reduce congestion while providing new development opportunities for the growing county. The Transit Task Force, a panel of community leaders and major landowners convened by County Executive Ike Leggett, came to similar conclusions earlier this year. However, not everyone's convinced that the proposed system, which could cost as much as $1.8 billion to build, will be effective. A study from the Institute for Transportation & Development Policy suggested that some routes wouldn't get enough riders to be worthwhile. Enter the Planning Department, who are working on a draft of the Countywide Transit Corridors Functional Master Plan, a guide for how Montgomery County's transit network should look in the future. Planners focused on routes within the downcounty, where transit use is already high, and along the rapidly developing I-270 corridor, where transit use could be high in the future. Unlike previous plans, this one emphasizes the need to give buses their own lanes, whether in the median of a road or by repurposing lanes currently open to all traffic. Planners found that this would make the system more reliable, reducing travel times and moving more people than cars could. They also found that taking lanes away from cars wouldn't result in additional congestion or lower driving speeds. One big reason for this is that roads leaving the District get wider upon entering Montgomery County. The 4-lane 16th Street in DC becomes 12 lanes—6 for 16th and 6 for Colesville— after crossing the border. Georgia Avenue is 4 lanes in DC and 6 in Maryland. So is New Hampshire Avenue. Therefore, for these radial routes, the planning department concluded that it wouldn't substantially affect traffic flow to make the road 4 lanes for cars and 2 for buses. Nonetheless, the Montgomery County Department of Transportation has been reluctant to take away lanes from cars, fearful it would hurt drivers. 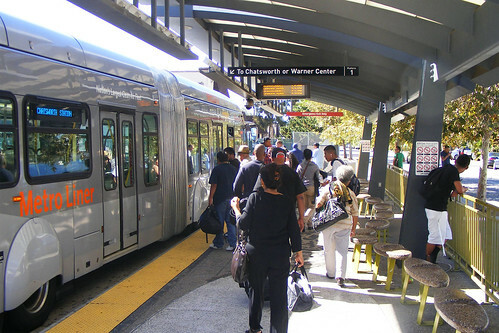 As a result, Parsons Brinckerhoff's study assumed that most of the system would run in regular traffic with everyone else, promising riders a slower, less reliable trip. To determine where BRT would be most successful, planners looked at existing activity centers like downtown Silver Spring, and areas like White Flint where lots of development will occur in the future, to see where riders will want to go. They also analyzed current and projected transit ridership. Finally, they suggested where stations might go to draw the most use. 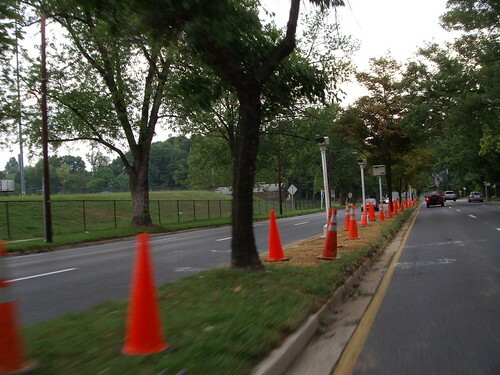 Several routes that appeared in earlier proposals, like Muddy Branch Road, Connecticut Avenue, Old Georgetown Road, Norbeck Road and the Intercounty Connector, were removed because they were found to have few riders. These recommendations go a long way to making a successful Bus Rapid Transit system in Montgomery County. They focus on the areas where transit use is already high and emphasize the need to support transit with dense, mixed-use development and good pedestrian and bicycle connections. Some proposed BRT corridors, like Randolph Road, wouldn't have dedicated lanes at all. Should there be even more dedicated lanes? However, the recommendations' emphasis on dedicated lanes may not go far enough. Buses would still run in mixed traffic on portions of some roads, like University Boulevard between Four Corners and Takoma-Langley, New Hampshire Avenue between Adelphi Road and White Oak, and the entire length of Randolph Road. On other roads, like Veirs Mill Road, buses would have just one, reversible dedicated lane, which could save money but may be difficult to execute and confusing for riders. These corridors are already home to some of the county's busiest Metrobus routes like the C, Y and K lines, and serve areas slated for intense future development, like Wheaton, White Oak and White Flint. If we're really serious about providing an alternative to driving and improving transit commutes for current and future riders, we'll have to make room for bus lanes here as well. If the Planning Board votes to approve the Countywide Transit Corridors Functional Master Plan in January, it will then go to the County Council for a vote in the spring. That's when the County Executive and Montgomery County Department of Transportation will also be able to give input and make changes. In the meantime, planning staff will present their findings at a series of public open houses next week. For more information on the open houses, you can visit their website. I remain puzzled why planners keep sticking in a Georgia Avenue route into Silver Spring when Councilmember Elrich only envisioned a system that stopped at Glenmont or Wheaton. The purpose of this is to get people out of the cars and into metro, not set up a competing system to metro. If you eliminate the Wheaton to Silver Spring portion you don't have to deal with the enormous problem of routing buses underneath the Beltway between Forest Glen and 16th street. BRT along Georgia Avenue (or likewise, along Rockville Pike) isn't meant to compete with Metro, but rather be a "middle ground" between Metro (which has stops every 1-2 miles) and local Metrobus routes (which sometimes stop every block). County planners looked at where stops might go in their report and, on Georgia Avenue, suggested stops about every 1/3-1/2 mile. What you may not realize is that the people who live in the Montgomery Hills area would also like a walkable, livable area. The master plan has always called for a median down Georgia Avenue between Dale and the Beltway to provide a safe haven for walkers. A dedicated bus lane might eliminate the opportunity for a median. Look, I support BRT where it makes sense. But let's not gold-plate the plan to the point where it becomes unaffordable. It makes no sense for a BRT to go speeding past two metro stations. Why do making Montgomery Hills more walkable and providing more transit options have to be in conflict with each other? The way I see it, those two things go together. Besides, Georgia Avenue is 7 lanes wide in Montgomery Hills. If desired, you could take two lanes out for BRT AND a third lane for a median. Like I said, BRT provides another layer of transit between the existing local bus network and Metro, which has a more regional focus. Again, there isn't a conflict here. They can all complement each other. Dan, There's simply no way to remove three lanes on that stretch of Georgia Avenue without connecting 16th Street and the Beltway directly. Not going to happen because the connector would have to pass through a historic district.